Home » If you loved Obamacare, brace yourself for Obamafunds! If you loved Obamacare, brace yourself for Obamafunds! Seeking to follow up on his spectacular efforts to fix your healthcare, Obama now wants to fix your retirement. Last Tuesday’s announcement during the State of the Union address should worry any American who cares about the Constitution, about checks and balances, about the free market… and about financial freedom. Why is this new plan – officially dubbed “MyRA” – so terrifying? Why should it be so awful to offer a payroll deduction retirement option to people whose job doesn’t offer such a benefit? After all, as a nation, the state our retirement savings is in dire straits, no? Oh yes, we are well aware of the abysmal state of Americans’ retirement plans. There are of course many reasons for why that is, with inflation being a key factor that simply makes the accrual of long-term value futile for most. The problem is the MyRA doesn’t solve the problems that make saving for retirement so difficult. When the contribution limit is only $15,000 total – not per year, but TOTAL – this is not a retirement account that will do much good for anybody. Some will counter that some saving is better than none, that this will get people accustomed to the idea of saving and that they will start to develop better habits. They’ll say that it is meant simply as a stepping stone, as after the account balance reaches $15,000 it needs to be rolled over to a conventional IRA. The problem here is that Obamafunds don’t roll themselves over to an IRA on their own; people will have to figure out how to do that themselves. But if those people can’t be bothered to start an IRA on their own in the first place, who’s to say they won’t simply max it out and leave it there? Especially when the government is placing a guarantee on the principle in Obamafunds, whereas in an IRA it can be lost? No. 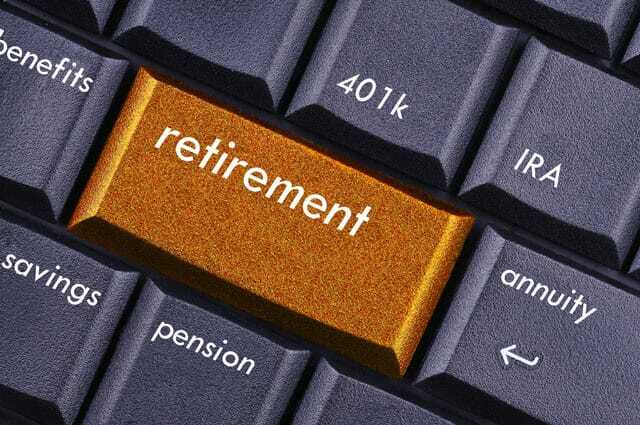 When it comes to the retirement security of Americans, Obamafunds don’t solve the problems. What the program does do is put the camel’s nose under the tent for the government to gain access to more of Americans’ retirement savings. You can almost imagine the bureaucrats’ mind at work, as they imagine all of the problems that that could solve. Think of all the “problems” that Congress has “solved” by raiding the so-called “Social Security Lock Box” and replacing all funds there with government IOUs; do you think our representatives in Washington deserve more control over retirement funds? And yet, investments in Obamafunds will be limited to government bonds. Fantastic. It may seem innocuous now, but when government puts in place a program that solves no problems but sets up channels to funnel money to its own bonds, you can make a pretty safe bet that eventually it has the potential to be in a position to divert money from the private sector and into government – right where our bureaucrats think it belongs. It might be simple changes in tax policy. For example, maybe some will argue that it’s “not fair” that private retirement accounts make a decent return, above stated inflation and what the Obamafunds make. Maybe coupled with that, more will contend that the $15,000 limit should be lifted to incentivize more money into government sponsored/controlled/guaranteed accounts that benefit the government, while private accounts and private investment gets pummeled through taxation. Who knows where this will go, but the way it is presented, it makes little sense. Our advice is to take the info we have so far with a grain of salt, to proceed with the retirement savings plans that you already had in place, and yes, maintain the regular additions to your gold-backed IRA account. If all else fails, you’ll be glad you did. One of the “greatest buying opportunities” in history for gold? Who has Bernanke really helped? 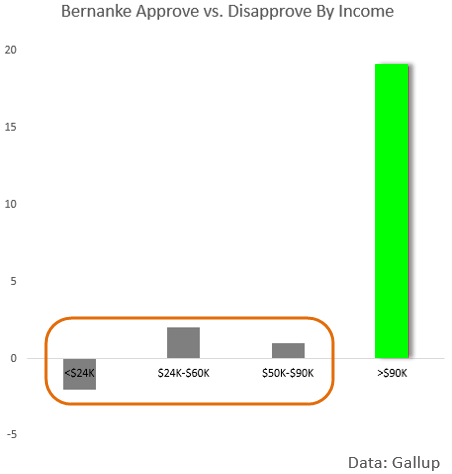 The numbers couldn’t be clearer – only one segment of the population thinks much of Bernanke.